The Panasonic XProtect Professional has been discontinued. No direct replacement is available. XProtect Professional is a digital surveillance system capable of controlling up to 36 cameras per server with good management, flexible scheduling and fast searching. XProtect Basis+ is just right for a business that has a small to medium sized security installation. These solutions are attractively priced with functionality to provide essential or expanded features best suited to your needs, for the most value in your surveillance investment. 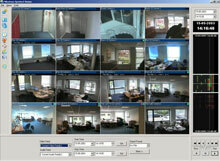 XProtect is a digital surveillance system with good management, flexible scheduling and fast searching. Controlling up to 16 or 25 cameras per server, XProtect Basis+ interface with standard IP video and computer hardware equipment - efficient and easy to install or add to later on.